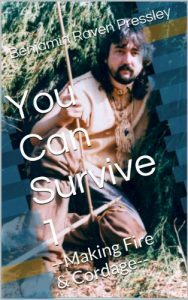 This little book will teach you a lot about fire making. It discusses several techniques as well as finding wood, tinder and much more. As a bonus there is also a how-to on making cordage from plant fibers in the wild. This could be a life saving skill. You never know when you will need string for making a bow string, making fire, binding a wound, setting a trap or snare. Great information and only 99 cents from DESTIN-E BOOKS.